jungle for a very specific set of combatants. From its very first moments, then, West Side Story offers us a sweeping vision that quickly segues into the intimate. Adapting the 1957 Broadway show of the same name, featuring songs by composer Leonard Bernstein and lyricist Stephen Sondheim, directors Robert Wise and Jerome Robbins (who translated his original stage choreography to the screen) fill their 70mm frame with ecstatic movement, operatic emotion, and brilliant color: it’s a dazzling Hollywood spectacle yet it still retains a remarkable delicacy and texture. Unlike so many big budget films across Hollywood’s history, and certainly many shot in 70mm, West Side Story does not rely upon the size of the image or the sharpness of the color scheme to compensate for weak characterizations. Here is a film, rather, that begins with canonical tropes—ethnic rivalry, star-crossed lovers, youthful abandon—and works its way outwards. To riff off another Hollywood classic, the problems of two rival gangs might not amount to a hill of beans in this crazy city, but West Side Story makes you feel the emotional weight of those conflicts like few other films can. So much of West Side Story’s power, of course, flows directly from Robbins’s choreography—a reality that the film honors to the fullest. It’s become common to bemoan the slicing and dicing of dance in today’s cinematic musicals, with breakneck editing speeds and a multitude of close-ups replacing the longer takes and shot scales that once allowed for appreciation of the body in motion. It would be underselling Wise and cinematographer Daniel L. Fapp to claim that they simply hang back and let Robbins’s movements do the heavy lifting, but there is true elegance in the way the horizontality of the frame is used to emphasize the thrilling oppositions that structure so many of the major dance numbers. As befitting a musical centering on two rival gangs, the choreography frequently pits two groups against one another on either side of the screen—most often the (Caucasian) Jets and the (Puerto Rican) Sharks as they battle over territory in their overlapping West Side neighborhood. The kicks, jumps, and snaps of either faction at once showcase the cohesion of their side and intimidate their adversaries with feats of aggressive agility: rarely has dance in a movie musical had such crackling narrative purpose. This dynamic reaches a particular height in the number “America,” which maps two varying dichotomies—male/female and assimilation/isolation—over one another. The Sharks’ leader, Bernardo (George Chakiris), bemoans the poverty and prejudice that he and his fellow Puerto Rican immigrants have received since arriving in the United States—a well-justified complaint, to be sure—while girlfriend Anita (Rita Moreno) dismisses her paramour’s roe-colored nostalgia for Puerto Rico and praises the freedoms and amenities of their adopted homeland. Their argument, informed by differing worldviews and sensual energy, spills over into the larger group and results in a battle of wits where the “he said/she said” wit of the song’s lyrics is matched by the dynamism of the men and women’s movements. Difference, both cultural and aspirational, rests at the heart of West Side Story’s chief conflicts—or, at least the inability to conceive of difference as something good—but it also provides the impetus for its most kinetic displays of physical grace and movement. West Side Story contains its share of more conventionally “cinematic” flourishes, most notably some scene transitions that utilize filters and optical effects to create sudden bursts of color or overlapping imagery. In some ways, though, the most vibrant stylistic choice is how urban space frames the characters in moments of passion or repose. This becomes especially true when discussing the film’s star-crossed lovers: Tony (Richard Beymer), the ex-Jet attempting to forge a less chaotic life as a storekeeper’s assistant; and Maria (Natalie Wood), the sister of Bernardo and a newcomer to the United States. Their initial meeting at a local dance is underscored by a sudden drop in illumination and twinkling dots of light that fall like snowflakes around them—a gently dreamy atmosphere to complement their tentative first dance. Later, when Tony exalts the name of his beloved in the song “Maria” as he walks through the streets, a particularly striking image finds him stopped in front of a row of tall windows, the tint of the glass forming a block of horizontal green light. The visuals at once overwhelm Tony physically and visualize the intensity of his outsized passion. Such moments speak to West Side Story’s inspired sense of aesthetic proportion, using the clarity and visual texture of 70mm film as a means of externalizing the story’s emotional core. It might seem odd that an analysis of what is essentially an adaptation of Romeo and Juliet could go on for multiple paragraphs without discussion of its central couple. 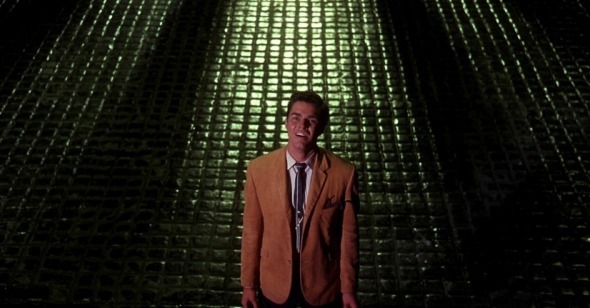 It implies no disrespect to either Beymer or Wood’s fine performances to say that such an impulse reflects one of West Side Story’s great strengths. As a film, it concerns itself as much with the seductiveness and self-destruction wrapped up in violent factionalism as it does with the couple that seemingly transcends it, making the story’s tragic conclusion all the more powerful. Because the movie spends enough time with not just Maria and Tony but also Bernardo, Anita, Jet leader Riff (Russ Tamblyn), and the various groupings of Jets and Sharks, the film’s climactic deaths reverberate in complicated and sobering ways throughout the world that it has set up and explored. We feel the full effects of this not only in West Side Story’s bracingly somber final scene but also in the Saul Bass–designed closing credits sequence, which places the names of most of the principal talent as scrawl on a cluttered, anonymous building exterior. The camera zooms in to find each individual amidst the riot of graffiti. Even in its final moments, then, West Side Story finds the singular detail within the urban tumult—a poetic encapsulation of its scope as well as its generosity. West Side Story played August 21 and 22, 2015, at Museum of the Moving Image as part of See it Big! 70mm, a series co-programmed by Reverse Shot and Museum of the Moving Image.